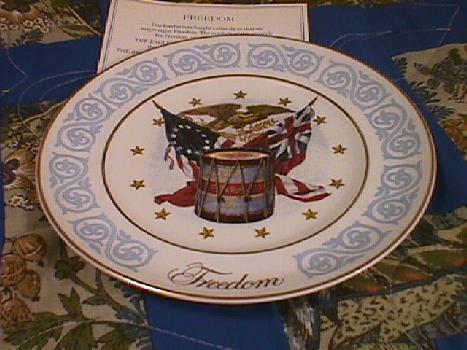 freedoma A 9 inch plate still in the box titled FREEDOM for Avon by Enoch Wedgwood England 1974. This plate is showing what I would call a few age cracks. The colors are beautiful and the gold trim really adds to it. . Please see the photo. All emails welcome. Buyer to pay $4 priority shipping in the US plus insurance if desired. Please take a look at the other items we have for sale. Thank you for our interest.